The home page of Hyper displays the client's Email and allows a quick and simple access to the variety of tools, areas and modules of the system. The E-mail system is an integral part of the CRM (customer relationship management) of Hyper and Uniquely allows advanced operations with its other modules, clients/suppliers cards, tools, tasks system and service tickets. The reliability of the system is very high, it does not allow the collapse of the data and provides the user with unlimited storage. Save time work - because Time Is Money. All of the information and documentation files are quickly and easily accessible and linked to the calendar, customers / suppliers cards, tasks and service tickets. Obviating multiple systems - Obviate the need to use multiple systems and external Email programs in your business. It allows an easy workflow and connection with the data of the Hyper's CRM system. It organizes and creates comprehensive documentation of all correspondences, to optimize and streamline your workflow. Quick access to customers and suppliers cards and to their activities history directly from the e-mail system. Information sharing in the departmental and organizational level - Group mail boxes to use in departments of several team members or in the entire organization. Sending an email distribution for advertising / marketing and easily adjust and customize it to different recipients. Create a new task / service tickets from any Email message, for further assistance or treatment of specified department / employee. The main page of Hyper, presents the Email system and includes additional supporting related tools: Tasks management, Personal Contacts, Password storage, Sending EMail in wide Circulation and Sending SMS messages. Choose Mailbox. For further information, please read the next section. Attach Message into Client / Supplier Relationship Log. Support Tools - Tasks management, Personal Contacts, Password storage, Send EMail in wide Circulation, Send SMS messages and Create Email Signature. System Administrator - For further information about definitions, clarifications and remarks about the Email system, press here. For general information about Hyper EMail system and for quick start, press here. Inbox - The incoming messages. Sent Items - The sent messages. Drafts - Unsent saved messages. According to the chosen Mail box, all messages from the last 90 days will be presented. Any message that was received / sent earlier will be automatically saved to the Archive Folder and can be found by using the Search Mail tool. - Spam. This message was marked as spam by the system. In order to approve the sender and cancel this mark, open the message and click on Add sender to white list button. For further information about the spam definition, read the system administrator section. Additional fields can be displayed according to the users needs. For further information click here. Single click on selected message will present a preview of the message. Double click will open the Mail viewer window. Delete Delete the selected messages. Deleted messages will be moved to the archive. For further information click here. Add sender to white list Cancel the Spam label for the this sender. Sender will be marked as Spam by the system, according to definitions of the users authorization (Employees module), in the "Spam Filter" field. For further information Read the system Administrator section at the bottom of this page. Attachments Tab - After opening a message, the attachments tab is available. The attached files will be displayed in the table. Click the icon to open the file or click the checkbox to make the saving buttons available. 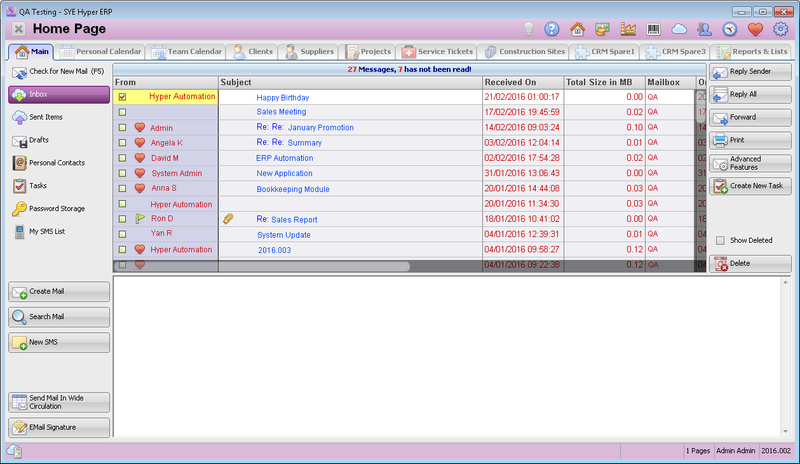 This option allows to automatically attach message info Client / Supplier Log. The linkage is done by comparing the Email address with the Client / Supplier Email addresses or domain name (taken from the "Web Page" field). Has Attachments Choose whether this message has any attachments. Any spam message will be automatically moved to the deleted items folder (archive). System administrator, read more about the spam filter definitions at the bottom of this page or click here. Deleted messages can be restored by choosing the required deleted message from the deleted items display, and press the Restore button. The message will be moved back to its original Mail Box. Send Email message to multiple attendees for marketing and advertising purposes. In case of deleted Email messages and their related objects (this is a very rare event), a retrieval and re-download of the messages can be executed. This action can be done by deleting the Emai_Servers_Sync table records, for the required dates.